On March 27, the U.N. Human Rights Council adopted ResolutionA/HRC/28/L.18 which expresses “grave concern at the detailed findings made by the Commission of Inquiry” which articulated crimes against humanity committed by the Democratic People’s Republic of Korea (the DPRK or North Korea). The Resolution calls for an international conference on abductions as well as an International Criminal Court referral from the U.N. Security Council. The resolution also urges the DPRK to acknowledge and end human rights violations, and requests regular oral and written reports by the U.N. High Commissioner for Human Rights and the Special Rapporteur On the Situation of Human Rights in the DPRK. Accredited by Jubilee Campaign to the Human Rights Council, Mr. David Hawk attended the March session of the Council in Geneva on behalf of theCommittee for Human Rights in North Korea (HRNK) with a representative from Unification Radio and a former DPRK prisoner also accredited by Jubilee Campaign. Mr. Hawk spoke at a side event panel that included a screening of “Answer Me,” a film produced by the International Coalition to Stop Crimes Against Humanity in North Korea (ICNK). During the HRC session, DPRK representatives were hostile to UN condemnation of their country’s human rights abuses. In response to urging for restrictions and pressures on the DPRK, some international representatives strongly oppose country-specific UN resolutions and therefore could not support these initiatives. However, a majority of the Council again approved the Resolution. The delegation lead by Mr. Hawk responded to the DPRK’s counter-measures, and also contributed to this year’s draft resolution on the situation of human rights in the DPRK. 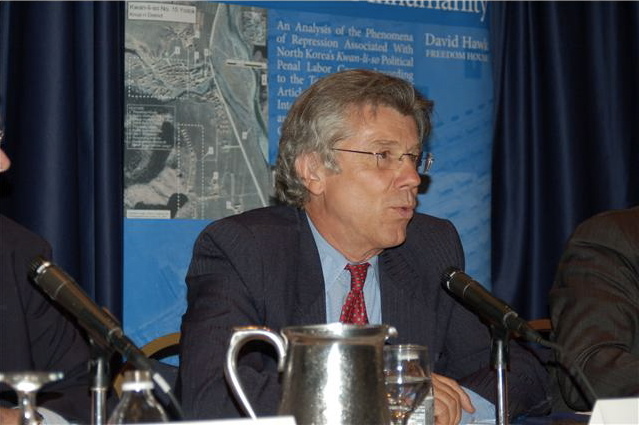 David Hawk, former Executive Director of Amnesty International and leading expert on North Korea human rights issues, is due to release a chapter in Law and Policy on Korean Unification: Analysis and Implications. One year after the U.N. Commission of Inquiry (COI) released its extensive report finding that the DPRK engaged in systematic crimes against humanity against its own people, Mr. Hawk catalogs how the regime engaged in countermeasures describing their types and scope. In this forthcoming chapter, entitled “North Korea’s Response to the UN Commission of Inquiry Report on the Situation of Human Rights in the Democratic People’s Republic of Korea,” David tells the context of the COI’s February 2014 Report of the detailed findings of the commission of inquiry on human rights in the DPRK and endorsement by the March 2014 session of the Human Rights Council of the findings and recommendations of the COI on North Korea. In his chapter, Mr. Hawk details the “remarkable series” of internal and external North Korean responses to these accusations of human rights violations since February 2014, which escalated during the fall session of the U.N. General Assembly. He finishes with predictions of North Korea’s future cooperation with UN human rights standards. David Hawk has also researched and authored a number of milestone reports, including the first systematic and comprehensive documentation and analysis of the political prison camp system in North Korea using satellite imagery. He wrote this latest chapter with editors Jong-Chul Park and Jeong-Ho Roh. This fascinating chapter articulating the DPRK’s efforts to deny hundreds of pages of testimony by victims of crimes against humanity and to thwart international accountability can be found here. Whereas past UN efforts to expose atrocities in the DPRK and hold the regime accountable were met with rejection or silence, the COI report and recommendations have provoked active diplomatic counter-measures. During the recent U.N. Human Rights Council session, for example, the DPRK went out of its way to demand that the U.N. appoint a Commission of Inquiry to investigate the use of torture by the Central Intelligence Agency of the United States at the Guantanamo detention facility. The DPRK expressed “shock” at this discovery, and claimed that torture could never be justified under any circumstances. In an additional measure keeping the pressure on the DPRK to change and abide by international standards of human rights, the Human Rights Council decided to convene a panel discussion on these issues at its thirtieth session. The citizens of the DPRK deserve the freedoms enjoyed by free nations around the world, and Jubilee Campaign remains committed to this cause with friends like David Hawk and the HRNK as well as the North Korea Freedom Coalition which will be holding its annual North Korea Freedom Week in Washington DC April 26-May 2. For more information click here.